Special Devices Inc. was recognized for its quality and overall customer commitment by Inflation Systems Inc., a division of the Takata Corporation. In 2004 SDI was presented the Quality Award for North American Suppliers for delivery of quality product and timely response to customer requests for information. 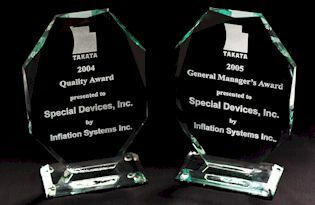 In 2005, Takata presented SDI with the prestigious General Managers Award recognizing SDI for their total commitment to customer satisfaction, support for production and design activities along with meeting stringent quality requirements. Internet Solutions by Avante Development Inc.